Veteran boxing experts marvel at the exploits of Harry Greb, Willie Pep. Henry Armstrong, John L. Sullivan, Manuel Ramos, Tony Canzoneri and similar stars of old times. On the other hand, today's critics marvel at the talent and achievements of Lennox Lewis, Mike Tyson, Floyd Mayweather Jr., Bernard Hopkins, Sugar Shane Mosley, Roy Jones Jr., Juan Manuel Marquez and Manny Pacquiao. Which makes us ask, which era was better, and who was best? I don't know the answer to those questions. But I'll tell you what: I know the answer to who was most courageous. Having a terrible pain in my mouth because of a toothache, I started thinking about one man whose courage and bravery can only be matched by that of Greb, Muhammad Ali in his first fight with Ken Norton, and Tyrell Biggs (yes, THAT Tyrell Biggs, who suffered a second round broken collarbone in defeating Jeff Sims by a ten round decision on March 23, 1986). That man went, when outside the ring, by the name Francisco Guilledo. When inside it, he was, as the great Mexican revolutionary hero, named Pancho Villa. Pancho was no power hitter. He scored less than 25 percent of his 80 wins by way of knockout. He was however, a supreme performer who outlasted opponents and outfought them, including people like Mike Ballerino, Abe Goldstein, Sammy Cohen, era sensation Johnny Buff, Terry Martin., Battling Al Murray, Kid Williams, Bud Taylor, and perhaps the greatest Flyweight of all time, Welsh pride, Jimmy Wilde. 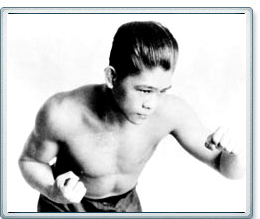 It was against Wilde, on June 18, 1923 at the Polo Grounds in New York, that Villa became the first Pinoy to win a world title, when he knocked world Flyweight laurels off the Welshman's head with a stirring 7th round knockout. Wilde entered the ring with an immensely impressive 134-3-2 record. One must also remember, that this was during the "newspaper decision" era. If you think today's judging is bad, it's excellent compared to the 1920's system in which there was no organized judging in many fights, leaving the newspapers to decide who the winner of those bouts was. It's difficult enough as it is today for any of us to decide who won a fight, even when we have the benefit of the different television angles, repetition cameras, and all that as television viewers, imagine then how hard it was then for those newspaper reporters who had none of what we have. Yet, amazingly, on 17 newspaper decision fights Villa had, he won 12, lost only 4 and drew one!! Villa was a kid at heart. He liked to party long and hard, playing with life as the new toy it was, at his 20's, to him. Maybe that's why he took unmeasured risks. But no immatureness conceals heart. If you are told that you are stepping on the world's highest rollercoaster, even if its' height is hidden by the fact it is dark outside and you cannot see down, you are still brave if you sit on it! Villa welcomed such blind and perhaps even foolish challenges, as he did with the rest of his life: with open arms. And so came July of 1925. Villa had an ulcer on one of his teeth. You know what I am talking about, and what I am feeling, when I tell you that messed up teeth hurt! But you and I never had an ulcer (well, I don't know about you, but I sure haven't!) Nowadays, one goes to the dentist and they take care of it with today's modern equipment and then you go home, relax for a day and you are ok to work the next day. That wasn't the case in the 1920's when dentists and other doctors, used obviously much more rudimentary machines. On July 4th, Villa had the ulcerous tooth removed, with I suspect, a couple of anesthesic injections put on him to ease the surgery process. I can only suspect, for this is Pancho Villa we are talking about, and knowing him, he may not have minded at all that should they had taken the tooth out without any anesthesy, since Villa could take pain so well. Told by the doctor not to fight for some time, Villa nevertheless headed to the Oaks Ballpark somewhere in Emeryville, California, that same afternoon. To face a fella named James McLarnin. The same Jimmy McLarnin who would bring Northern Ireland pride by becoming world Welterweight champion, and who pulled the highly unlikely, almost impossible sextuple-feat of beating Villa, Fidel LaBarba, Benny Leonard, Barney Ross, Tony Canzoneri and Lou Ambers!!!!!! Villa fought grimly, with all the force in his muscles and in every vein of his heart. Despite giving a few pounds to the then Bantamweight (and who'd be a Super Bantamweight in today's boxing) Northern Irishman, he nearly won the fight. But in the end, the disadvantages of fighting with an operated on mouth and of meeting such a quality boxer with such a weight disadvantage proved too much for Villa, and he lost a close 10 round decision. He could have turned his back and stopped fighting back, like fellow International Boxing Hall of Fame members Roberto Duran and Edwin Rosario once did; he could have stayed on his corner, like so many legends have done; he could have bitten McLarnin's ears like Mike Tyson did to Evander Holyfield; or he could have just postponed the fight. But Villa was one of those rare breeds that would rather fight than breathe, and he went there, hands blazing, confident in his skills and what little power he really had, ready to give fans another thrill and to have fun. To have fun fighting, even in such a dire situation. In the end, Villa paid his lust for boxing by losing that most precious possession he had: his life. As a result of fighting with surgery done the same day, he suffered Ludwig's angina, from an infection that spread to his throat. On July 14th, 1925, Villa died, leaving with a brilliant 80-5-3 record, with 23 knockouts. He was inducted into the International Boxing Hall of Fame in 1991. So, as we discuss Manny Pacquiao today, we should take some time off and remember the man upon which Pacquiao and many other Phillipine greats, like Gerry Penalosa and Nonito Donaire, should look up to and thank for bringing life to Filipino boxing. That man was Francisco Guilledo, alias Pancho Villa, the Asian nation's first boxing world champion in it's history. Somewhere in the boxing Heaven, I have a feeling Villa will be smiling down at us.